Auckland walks to help you reach your 10,000 steps a day. Located in Auckland’s CBD, Victoria Park has a large, flat grassed area encircled by an historic pathway, lined with dominant london plane trees. It’s the perfect place for inner city workers to take a lunchtime walk or jog. This beautiful park offers a great short walk if you work or live in Freemans Bay. Albany Lakes park is located adjacent to the Westfield Albany shopping mall and offers a leisurely stroll around two artificial lakes. The Weymouth walkway loop is ideal for wheelchairs and prams. It leads you along the coastline of Manukau Harbour and the Puhinui Creek mangrove forest inlet. The Coast to Coast walk is a 16km route across Auckland from one coast to the other, from the Waitematā to the Manukau. It takes you through landscapes shaped by 600 years of Māori occupation, and through some of our finest parks and built heritage areas offering panoramic views along the way. The walkway is part of Te Araroa – The Long Pathway, a continuous 3000km walking track from Cape Reinga to Bluff. The Point to Point route takes you to sandy beaches that lead to panoramic viewpoints, green sports fields that give way to wide stretches of estuary and intimate nature reserves contrasting with cow-studded country pastures. The full walk is about 7.5km long, starting at the popular St Heliers Bay and finishing at Point England. Allow three to four hours. Whatever your age or fitness, you will be able to enjoy some part of the walk. Explore Waiheke’s coastline, pass through native bush and visit historical sites, all in a day’s walk on Te Ara Hura. 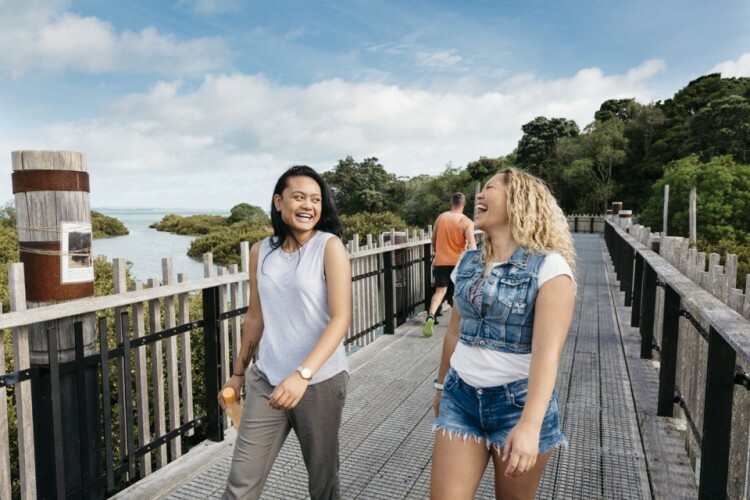 A 100km network of walking tracks, Te Ara Hura is the perfect way to explore Waiheke Island and get away from the hustle and bustle of the city. Choose between a day trip or multi-day adventure, there’s a great range of walks from short and easy through to the more challenging. All tracks are connected so you can start at any point, finish wherever you want and go in any direction. Visit the Mountain Safety Council website for information about what to bring and do before going on a day walk. Walking isn’t the only way to reach your daily step count – you can run, cycle, swim or dance. There are over 40 different activities you can convert to steps including activities for persons with disabilities. Park a little further away from your destination and walk the remaining distance. When taking public transport, get off a stop or two early. Enjoy a walk during your lunch break. Buddy up – go for a walk with a friend. Walk the longer way round to the printer or bathroom and visit a colleague in person instead of emailing. Join an Auckland Council Pools and Leisure Centre and go for a swim or try a group fitness class. Avoid boredom by changing your route or visiting a new park each day. You don’t have to do it all in one walk. Break it up into several smaller walks during the day. *steps based on an average stride length of 0.762m.